​​Every leader's dream job is leading the dream team. I am a sports nut, and watch all type of sports as a hobby and to continuously improve my management, coaching, and leadership skills. I don’t have an MBA, and my only craft is people management however in today's day and age if we are not honing our skills on a regular basis we will risk becoming a dinosaur. Hence, I use sports as one of my primary learning tools - the other two are books and leadership videos. 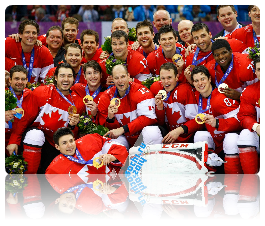 Recently I was watching a documentary on the process behind assembling Canada's Ice Hockey team for 2014 Sochi Olympics, and why they left few superstars off the roster. During the same week I was having a conversation with one of our leaders at work about why certain teams were performing so well. It dawned on me that the definition of a dream team is not a team of people who have the best statistics. The 2014 Team Canada left off 4 players who had better numbers than 6 of the players they selected. The definition of dream is an Engaged Team! 1. Connect with our people. We can do this by getting to know our team members and taking an interest in what is important to them. Having scheduled 1:1s on regular basis, impromptu chats, giving positive as well as constructive feedback, and helping remove the roadblocks that hinder performance go a long way in connecting with our people. 2. Listen to our people. Our people should have a voice, they should know that we listen, that their opinion matters, and that we care. We often underestimate how majority of our people can achieve more, feel a better sense of accomplishment, and perform better if we empowered them. 4. Value and appreciate our people. I am convinced that every person wakes up everyday thinking they want to go to work to do a good job, and most of them do. We should take the time to appreciate their work and value their contributions. Show them respect. A regularly scheduled 1:1 will help convey our appreciation for something they did that week or in the recent past. 6. Invest in their development. Most of us agree that our people own their careers. However as leaders we have a responsibility to develop them and help them grow their career. We should provide them with training and opportunity to learn. We should give them feedback on what gaps they have to bridge and/or what they have to achieve to further develop or grow their career. We also have a responsibility to make them understand that doing a good job in their current role doesn’t mean they are ready for a promotion. We should however be committed to help them get to the next level of their career. Lets face it, sometimes work is boring, tedious, heck at times even stressful. We have a responsibility to add fun to our work place. Having team lunches, going for beers, taking the team out for team building activities, celebrating birthdays, promotions, milestones are some of the things we can do to have fun with our people. ​If we do the above 7 things and do them well we will have an engaged team which will lead to a successful team. No matter what the mission, the goal, or the project, history has shown over and over that engaged teams always triumph. I practice what I preach, however I am not perfect and I do have my flaws. If you are on my team or on my extended team, and you have not experienced one or more of the above 7 please refrain from publicly shame me :) However please send me direct message, email, text, or WhatsApp so we can have a chat, I will appreciate it if you help me. After all that's how I will get better. Thank you for reading. As always your comments about this post are welcome. Why You Should Not Miss SOTI SYNC 2017?